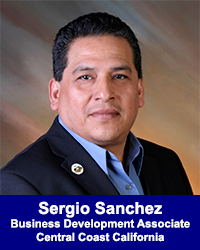 Sergio Sanchez Joins California Consulting as Newest Business Development Associate of Central Coast California - California Consulting, INC.
California Consulting LLC is pleased to welcome the newest member our Business Development Team, Sergio Sanchez. He will cover Central Coast California. Sergio began his career in public service in November 2002 when he was first elected to serve as a member of the Salinas City Council. Sergio was elected to represent District 1 in the City of Salinas, one of the most diverse and densely populated districts in the city and in the Nation. He was re-elected to two additional 4 –year terms in November 2004 and again in November 2008. Prior to getting elected, Sergio served as a Committee Member for the Redistricting Committees for the City of Salinas, County of Monterey and the Salinas Union High School District and as a Commissioner of the County of Monterey Equal Opportunity Advisory Commission. From December 2010 till February 2013, Sergio Sanchez worked as District Director for Assemblymember Luis A. Alejo California State Assembly representative for 30th Assembly District.